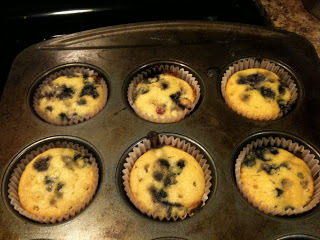 So tonight I made blueberry muffins but not the “traditional” way. I used Coconut Flour instead of regular flour. I may have previously said this in a prior post (I don’t remember) but I am trying to keep gluten and dairy out of Abigail’s diet the first year of her life. It has been found to be the best because her digestive system isn’t fully formed yet. Both gluten and dairy can be inflammatory agents…they are for very young children. So basically, this means that Abigail could be more susceptible to sickness and digestive problems by eating these things regularly her first year. 1. Blend together eggs, butter, coconut milk, honey, salt, and vanilla.